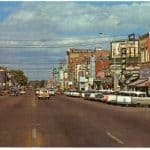 What did teenagers do for fun in Greeley, CO, in 1959? Greeley’s downtown featured every type of retail business within a five-block radius of Lincoln Park, including three bakeries, five beauty shops, six men’s clothing stores, seven drug stores, eight grocery stores, nine barber shops, 10 ladies’ clothing stores, 15 service stations and 16 restaurants — and that doesn’t even count the awesome lunch counter at Woolworth’s. 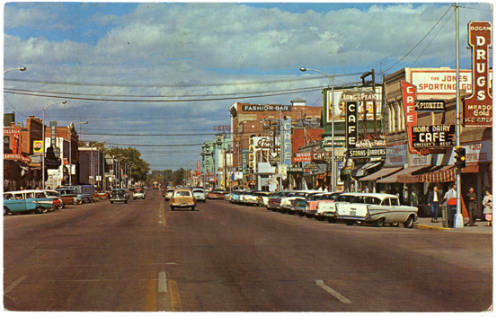 Most families had access to at least one car and teenage motorists were inspired to cruise around the downtown area. Boys were showing off their cars and girls were enjoying the view. Cruisers began by heading north on 8th Avenue to 7th Street, turning left, cruising to 9th Avenue, turning left, cruising to 8th Street, turning left, cruising back to 8th Avenue, turning right, cruising south on 8th Avenue and finally turning around (possibly at the A & P Drive-in or Peter’s Popcorn & Candies) and repeating the process. This circular route was nicknamed Dizzy Block, which became known to some simply as “D” Block. Businesses that inspired teens to spend their baby-sitting money or paychecks were stores such as Kress’ Variety Store and Fashion Bar, having sales that attracted the girls. Three billiard parlors attracted the boys, with a favorite being Elite Lunch and Cigar Store. From interviews with 1959 teens, we have learned that if you rummaged around in the couch and found 50 cents, you were set for the evening’s entertainment. Bogen Pharmacy featured a burger and a malt for a quarter. A movie at the Sterling, the Colorado, or the Chief cost a dime, and you had money left over for popcorn, candy and a Coke. Alternatively, if you made a big bowl of chili and brought chips, you and your friends could drive out to about 29th Street and 11th Avenue to the Motorena Drive-In Theatre and feast while watching the show. View looking north up 8th Avenue in Greeley. Businesses and cars line the street. Image credit: 2004.23.0003, City of Greeley Museums, permanent collection. Originally printed in the Greeley Tribune in May 2009. Reprinted with permission.